There's a 16-minute gameplay video to enjoy, too. Hard Reset Redux, the hi-def do-over of Flying Wild Hog's debut FPS that was announced back in January, now has a proper release date of June 3. The system requirements are out as well, and publisher Gambitious has posted a 15-minute “Bang Bang Boom” gameplay trailer that highlights some of the changes. You won't need a high-end rig to run this one: Updated it may be, but it's still a five-year-old shooter. We reviewed the original Hard Reset here and didn't much care for it. Personally, I thought it was pretty good, although even I can't deny that it grows repetitive fairly quickly, and is narratively incomprehensible throughout. 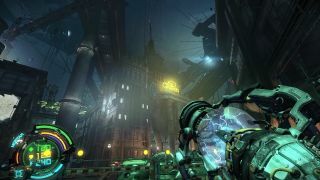 The Redux release aims to improve that experience, however, with i\better graphics, new enemy types, more consistent pacing and difficulty, a new 'quick dash' move, and a Cyber-Katana melee weapon—handy for killing rampaging robots, and also as a reminder of Flying Wild Hog's other game, Shadow Warrior 2, which is set to come out later this year.